Give someone you love a walk along a big, rugged ridge this year. Seeing things is important. If backpacking is too your liking, the recently proposed Wind River High Route looks like a good option. With Alan Dixon and Don Wilson’s extensive beta, including waypoints, the hike seems like a felicitous introduction to off-trail backpacking for the fit hiker. If you also packraft, and have a bit of experience with more complex off-trail navigation, you might consider this loop in the Bob, which is probably the best trip I did in 2013. The view above is looking south towards the summit of Haystack. You will be a might confused in a few places, but there are good human or game trails almost the whole way, with only occasional interruptions for cliffs and stretches of bushwacking. The views aren’t as in-your-face craggy as a place like the Winds, but the intricacy and extensiveness of what you can see at any given time is too much for the mind to grasp. The ridge walking along the Chinese Wall was so good that I’ve been contemplating a full N-S stroll along the Continental Divide, from near the Canadian border to Rogers Pass. It’d be ~80% off trail, with a lot of that on surprisingly good footing, and going as the elk go and staying off harder 4th class stuff would still keep you within a linear mile of the divide itself 90% of the time. 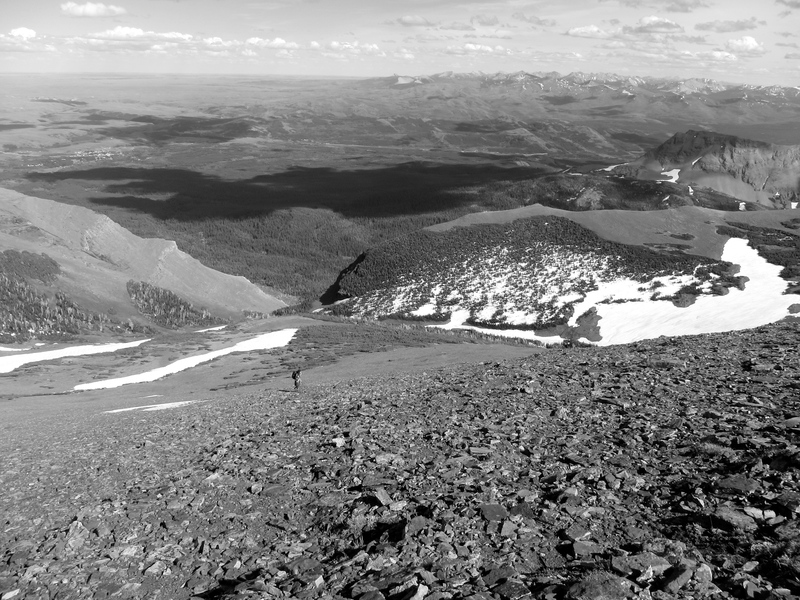 If that sort of trip is a bit long in either time or commitment, but you still want the experience of off-trail in Glacier summer, the Norris Traverse cannot be beaten. Though our off-trail, elk trail day back in August is one of many options which comes close. Out east there’s a ridge hike of a different nature, one I’ve tried three times and never fully completed; one I’d like to return to. 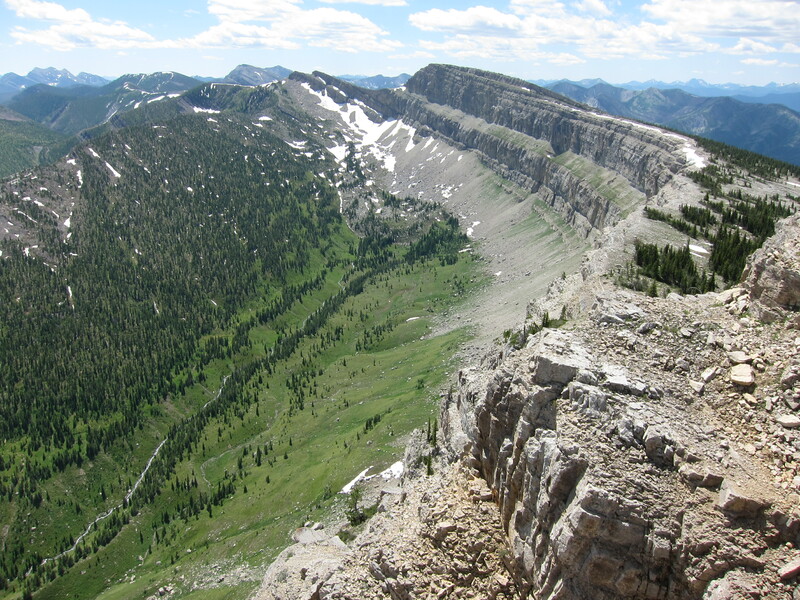 This path is approximate, but the full ridge traverse from Rooster Comb to Mt. Marcy in the ‘Dacks, with a return down Johns’ Brook, will be a delightful hike when I finally complete it. All my previous attempts have been day hikes, with weather and impending darkness shutting us down. The obvious answer is to bring overnight gear and enjoy a tiny bivy spot somewhere along the ridge. 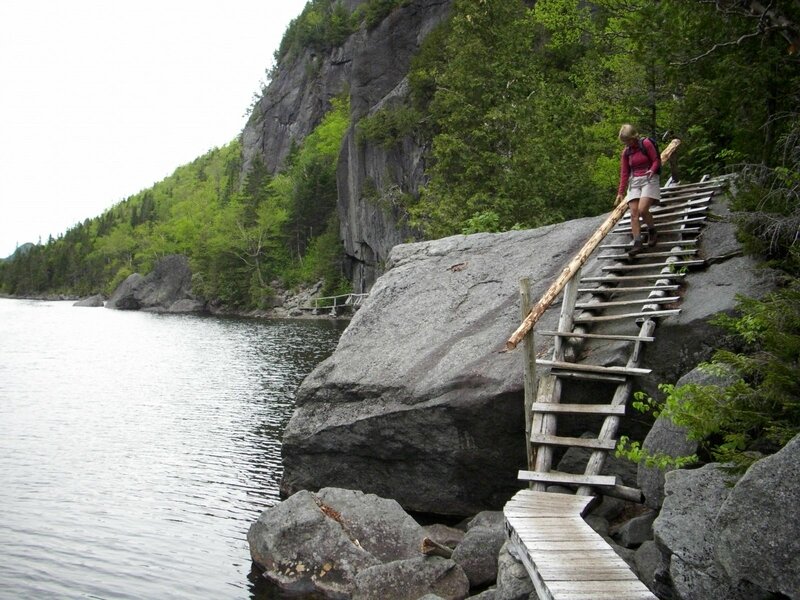 If you are inclined to set a big car shuttle, ending at the Adirondack Loj by hiking over March and down and around Avalanche Lake (pictured above) would be quite nice, though the forest and polished cobbles of Johns’ Brook are nice enough that they’d be a shame to miss. West coast hikers beware, miles do not begin to tell the story here. Most of the section above 2500′ or so are absurdly steep and rugged, with plenty of 3rd class moves on slick granite and the occasional ladder thrown in. And this is why the hike is so awesome, the magnificence of the setting is only matched by the kinaesthetic interest of the moves themselves. Ridges on your list to get and give in 2014? – Long Trail South from the Winooski River to Camel’s Hump summit in VT. about 4k’ of gain in 6 miles one way, riding the granite ‘knuckles’ of the mountain’s north flank with the odd third class move and root ladder to keep things, as you say, kinaesthetically interesting. – the Kalmiopsis Rim trail in OR, for the most complete solitude and most interesting plants on the west coast. I suspect you could create an interesting packraft loop via the Illinois River, though I don’t have the expertise to say. Hellish bushwhacking would be required, couresy of the Biscuit Fire. The Gallatin Divide in my neck of the woods is great sub-50 mile walk with expansive views and easy to moderate route-finding. Making use of the free shuttle bus from Bozeman to Big Sky, one car, and a bicycle the dedicated individual can get away with only 30 miles of driving. The version I mapped at that link is around 38 miles but it can be extended along obvious ridgeline to the South and East from Ramshorn Peak. Another great option to add to the stellar list of ridge walks listed above. http://shortburstsofwilderness.com/blog/2012/9/spanish-peaks-traverse. That Wind River route is definitely on my list. I don’t, but this is the route as I mapped it before the trip: http://www.gmap-pedometer.com/?r=5604008. The route finding on the off-trail section was pretty straightforward. Linking up the Mendenhall Valley to Downtown Juneau via mountain ridge is a dream of mine, even if I don’t live there anymore. Heinzelman Ridge to Nugget Peak, across the Lemon Glacier to Cairn Peak, Observation Peak, Salmon Ridge, Mount Olds, Sheep Mountain, Mountain Roberts, and down to Juneau. All hikeable, some class three scrambling, some exposure, ice ax needed, and a glacier crossing that was fairly straightforward as of five years ago. Best time of year would be June, when the weather is most likely to not be white-out fog, and snowfields are more filled in. No solid idea what the distance would be, but probably in the range of 40-50 miles. Someday, someday.